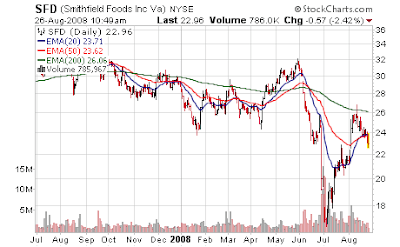 Both Smithfield Foods (SFD) and Sanderson Farms (SAFM) just reported so let's take a look - as an aside Buffalo Wild Wings (BWLD) fell off the cliff this morning, I assume off the chicken producers results and/or Sanderson Farms CEO comments about casual dining weakness - which again I say "why the surprise?" The American consumer in the lower and middle class is struggling with all the cost of life increases - I continue to be struck that the upper 0.5% who do most of this day to day stock trading, simple do not get it. Even a year later. I did add a bit to BWLD as it fell 8% down to its 200 day moving average of $33, but if it breaks that level, we'll cut back. Two weeks ago these stocks (Panera Bread is another) could do no wrong as the "consumer was back!" and "commodity inflation is dead! input costs will crater! Cramer said so!" - today they get hammered. Nothing changed 2 weeks ago - nothing changed today - just program trading jumping in and out of sectors. This is nothing but a traders market - jump in, scalp a gain, and get back out. No place for investors. Pork producer Smithfield Foods Inc (SFD) and chicken producer Sanderson Farms Inc (SAFM) reported losses on Tuesday as sharply higher feed prices continue to weigh on the U.S. meat industry. Flooding in the U.S. Midwest this spring, combined with strong demand by exporters, livestock producers, and the makers of ethanol, pushed corn prices to record highs this summer. At Smithfield, a loss on hogs overshadowed much improved earnings in pork processing, which were more than double a year earlier due to strong exports. The Smithfield, Virginia-based company reported a loss of $12.6 million, or 9 cents per share for the fiscal first quarter ended July 27, compared with a profit of $54.6 million, or 41 cents, a year earlier. That included $15.9 million, or 12 cents per share, in income from discontinued operations, plus $25.6 million, or 19 cents, in costs and charges. Excluding those one-time items, the loss would have been about 2 cents per share. On that basis Wall Street analysts on average expected a loss of 4 cents per share, according to Reuters Estimates. At Smithfield, the hog unit lost $38.8 million, compared with a year-ago profit of $93 million, as hogs, on average, sold for $55.50 per 100 lbs, but cost $61 per 100 lbs to raise. (I like to call this the "airline business model" - you know, sell something for less than it costs - than just wait for the Wall Street computers to rush into your stock, with traders clapping all the way because now you are losing less money then you did 6 months ago - meanwhile selling off stocks who actually make money because that was last year's trade - "profitability" is sooooooo 2007) It called the remainder of 2008 for hogs "unfavorable." 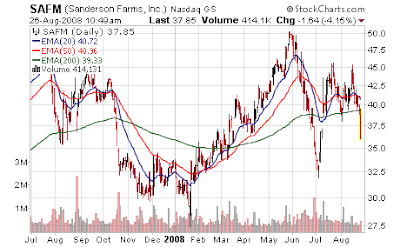 For the fiscal third quarter ended July 27, Laurel, Mississippi-based Sanderson Farms, the No. 4 U.S. chicken producer, reported a loss of $3.65 million, or 18 cents per share. That included a charge of $1.7 million, or 9 cents a share, paid to settle litigation. Minus the charge, Sanderson's loss would have been $1.945 million, or 9 cents per share. On that basis, Wall Street analysts expected a loss of 5 cents, according to Reuters Estimates. We continue to live in a hear no evil, see no evil environment - people of "high above the median" wealth trade off what they see/feel/live in their lives, and this disconnect between their lifestyles and what is really going on in the "real world" for typical people of modest means - leads to some strange trading decisions and movements. In my opinion this led to the "denial" stage all of summer 2007 and fall 2007 when all these people of means were saying "what slowdown? ", "what inflation?" "my personal assistant says prices are not going up that much so why all the whining?". Much like our politicians with their 2-4-6-8 homes, gold plated healthcare and benefits package - the "elite" in the country simply are out of touch for the struggles of the many. I think this wealth chasm only grows wider over the coming years as huge swaths of people who were relying on credit get by the past decade turn increasingly bitter, angry... and desperate. Just my take - and I hope to be wrong. Meanwhile, every time gas drops 40 cents it's time to build a new thesis about how these people who are facing a multitude of challenges, and a lack of credit to finance their old lifestyles will "be back".